EURASIAMARITIMEGMAILCOM are Supplier & Exporter Of Centrifugal Marine Oil Separators, industrial centrifuge, Oil Purifiers, Biodiesel Centrifuges, waste oil purifier, VCO Centrifuge Manufactured By Alfa Laval, Westfalia, Mitsubishi kakoki. The processing capacity of the centrifuge machines are between 500LPH to 20000LPH. 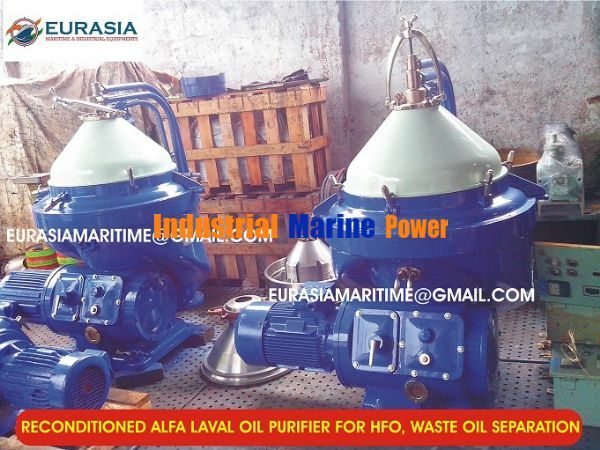 ALFA LAVAL FOPX-610 FOPX-613 & WHPX-510,WHPX-513 OIL PURIFIER - SEPARATOR FOR HFO PURIFICATION. HIGH SPEED, HIGH CAPACITY. 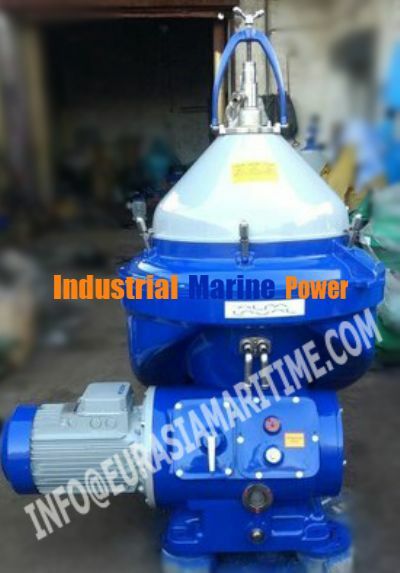 Liq-Liq-solid purifier, Vertical Disc type, 15Kw electric motor .Heavy Duty. Good for Waste oil, Furnace oil, biodiesel etc. Details: Reconditioned, self-cleaning fopx-613 oil separators: heavy duty, high speed, vertical disc type, liq-liq-solid purifier, brand alfa laval refurbished alfa laval model fopx-613 stainless steel separator. Fuel oil application with radial peripheral ports and slide for intermittent solids discharge. Open inlet with fixed paring device forlight heavy phase. Self triggered partial ejection with dosing ring. Purifier/clarifier design with direct drive. REFURBISHED ALFA LAVAL MODEL FOPX 613TFD-24 STAINLESS STEEL SEPARATOR. FUEL OIL APPLICATION WITH RADIAL PERIPHERAL PORTS AND SLIDE FOR INTERMITTENT SOLIDS DISCHARGE. OPEN INLET WITH FIXED PARING DEVICE FOR LIGHT AND HEAVY PHASE. SELF TRIGGERED PARTIAL EJECTION WITH DOSING RING. PURIFIER/CLARIFIER DESIGN WITH DIRECT DRIVE.INCLUDES BOWL TOOLS, INSTRUCTION MANUALS. EPC-400 CONTROL PANEL, THREE WAY VALVE AND CONTROL SOLENOID VALVES. Centrifugal separators, Disc centrifuge, alfa laval oil purifier, industrial centrifuge, used centrifuge, filtration machines, fuel oil separator, waste oil purifier, wvo centrifuge, oil purifier, biodiesel centrifuge, industrial centrifuge, centrifuge parts, laval centrifuge, alfa laval centrifuge, ship oil purifier, engine oil purifier, diesel oil purifier, Marine oil purifiers industrial centrifuges, alfa laval separators, disc centrifuge.